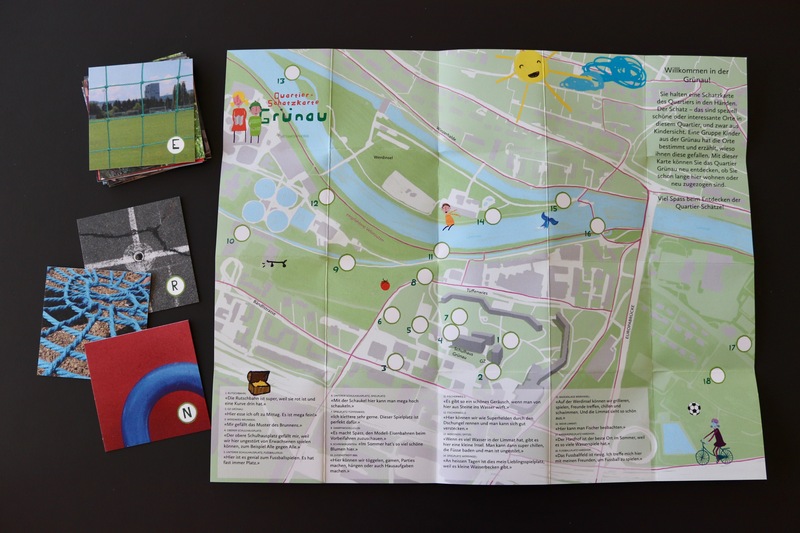 On a sunny Saturday in June, a group of children of the two neighbourhoods Grünau and Riesbach in Zurich revealed their favourite places in the area. After identifying their secret spots on a big map, they walked in groups through the neighbourhood explaining why exactly these spots are their favourite spots – for example a certain slide “because it is painted in a beautiful red”, a spot at a nearby river “because it makes such a beautiful noise when you throw stones into the water” or a garden “because over the summer the most beautiful flowers grow here”. Each child took a photo of a small detail of his favourite place. A cross was placed on the map. Back from the walk, the kids got a snack and reported about their experience. Over the summer months, synergo developed and produced a game with all the information about the favourite places. The pictures of the children were turned into playing cards. Each photo has a letter. When playing the game, one has to walk through the favourite places, determine the matching photo and enter the letter into the map. Sorted by numbers, the letters form a sentence. Everyone who is interested can get a game and discover the two neighbourhoods from a child’s perspective.